Dolls have long held a singular ability to unintentionally scare the daylights out of children and adults alike, for reasons that aren’t always easy to voice. 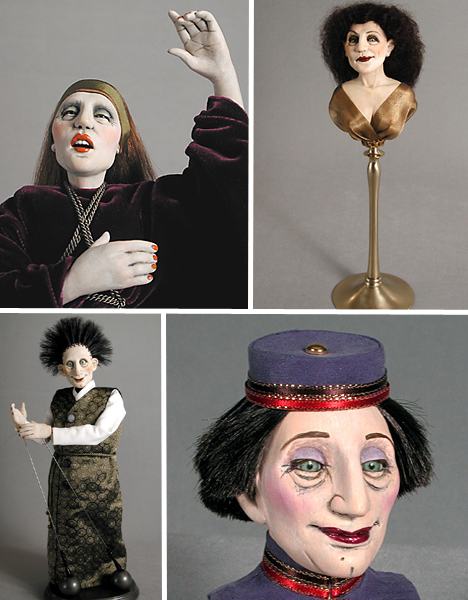 But some artists have learned to use that inherent creepiness to their advantage in making strange and surreal yet often elegant and intricate art dolls, figurative sculpture and puppets. 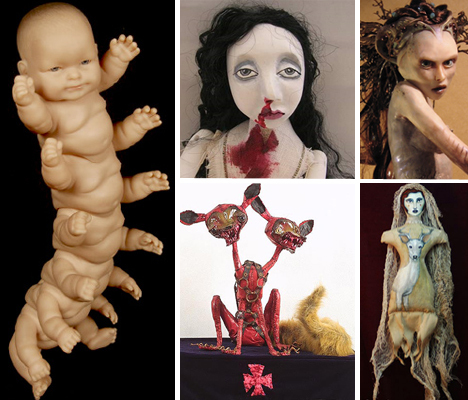 From otherworldly ball-jointed dolls to sculptures that could easily be props in a horror movie, these works of art are definitely not toys. Russian-born doll artist Marina Bychova creates breathtakingly intricate, ‘enchanted’ ball-jointed dolls made of porcelain, with amazingly detailed costumes and even hand-painted tattoos. These lithe, ethereal dolls are beautiful and delicate, yet dark – among the options available when ordering a doll is ‘body mutilation’. French artist Julien Martinez has a knack for creating characters imbued with a strong sense of melancholia, with red sagging eyes, wildly unkempt hair and funereal garb. Martinez says his inspiration comes from visual and literary sources, movies and fairy tales, and the history of costumes. 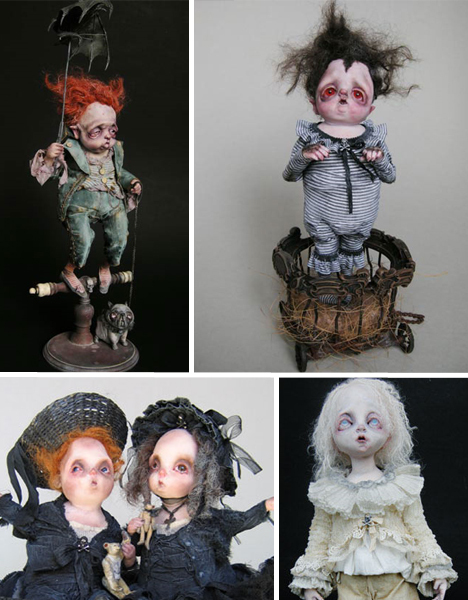 Self-taught New England doll artist Beth Robinson creates some of the most sought-after “strange dolls” in the world, which have been featured in numerous magazines and in galleries all over the U.S. and Europe. 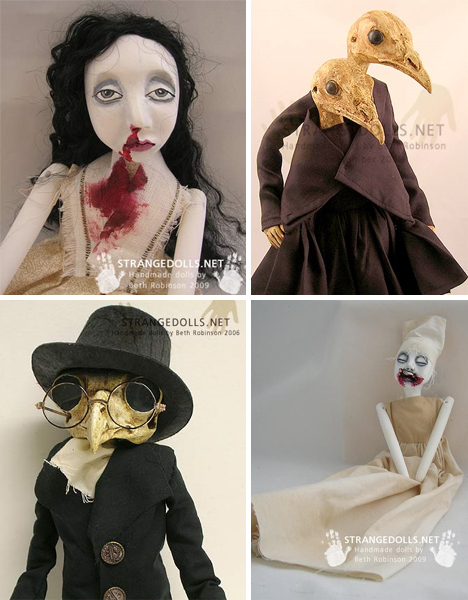 Jan Svankmajer is not so much a doll artist as a puppet maker and animator, but his work has been a great inspiration to the current crop of strange doll artists. 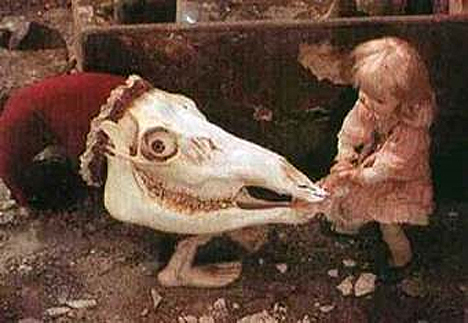 Svankmajer began making his bizarre 3-D stop-motion animation films in the 1960s which feature a mixture of real actors, clay figures, antique dolls, puppets and animal corpses. His dark and disturbing interpretation of Alice in Wonderland is perhaps his most famous accomplishment. 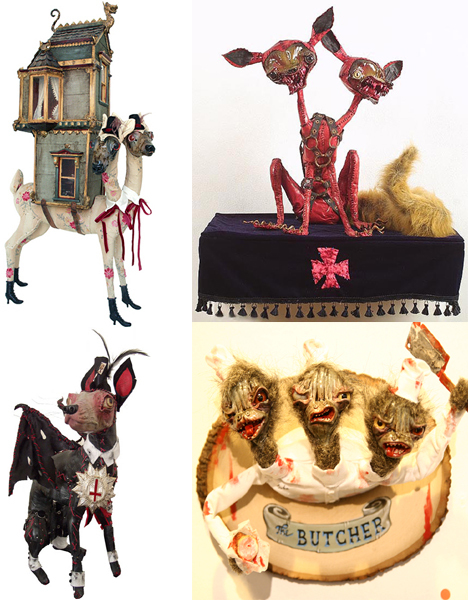 Elizabeth McGrath is the queen of weird sculpture, with a menagerie of creepy creations inspired by the relationship between the natural world and the detritus of consumer culture. Red-eyed rabbits, two-headed undead chihuahuas and cats in pirate costumes are just a few examples of the magnificently strange characters she has created. Kerry Kate Patteron’s ‘October Effigies’ stand out as one-of-a-kind even among a field of amazingly unique art, thanks to her method of hand painting doll-shaped stuffed canvas. Patterson, a visual effects artist for films, reproduces most of her designs as prints on canvas so that ownership is attainable for practically anyone. 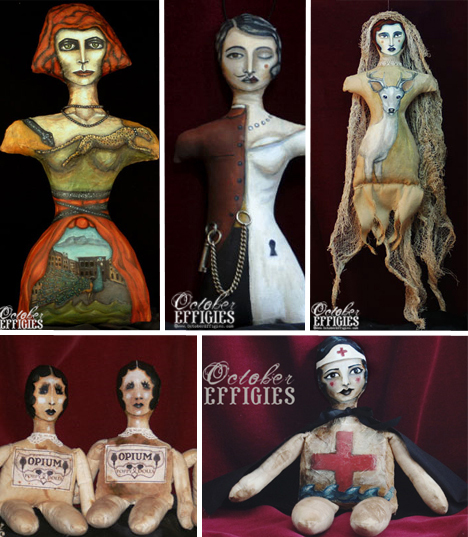 October Effigies have been featured in films including Black Dahlia and Silent Ghost Cinema’s The Ghost of Sleep. 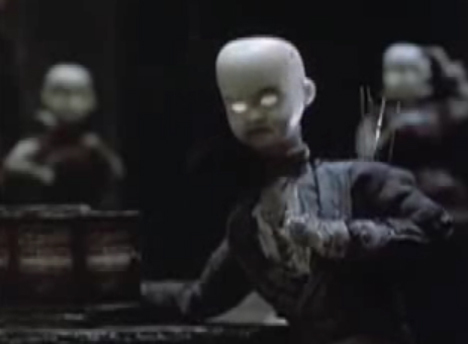 Like their predecessor and influence Jan Svankmajer, American-born brothers Stephen and Timothy Quay are puppeteers and stop-motion animators, but their work has served as a seed for the dark art dolls that are made by many artists today. Their dreamlike films revel in the bizarre and the macabre, starring hand-made puppets and figures that act out poetic, sometimes incoherent narratives. Toronto artist Lesley-Anne Green’s creations are more sweet and charming than dark, but are still a far cry from the homogenized plastic dolls found on store shelves. 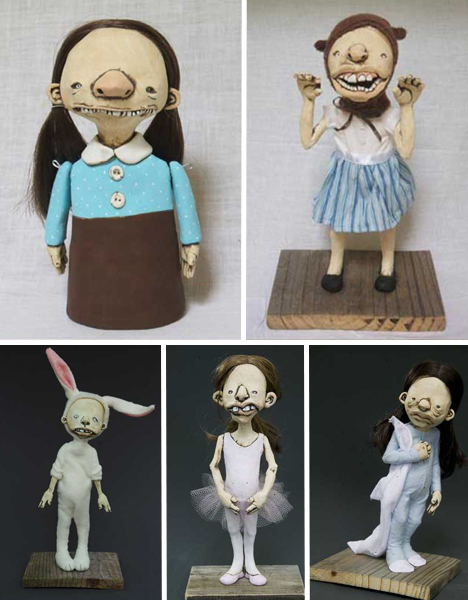 Green’s dolls are quirky ugly ducklings infused with the essence of childhood, warts and all. The Whalefish Studios website, which features the artwork of Ben Strawn and Jessica Robin, is like a treasure chest of strange and intriguing characters. 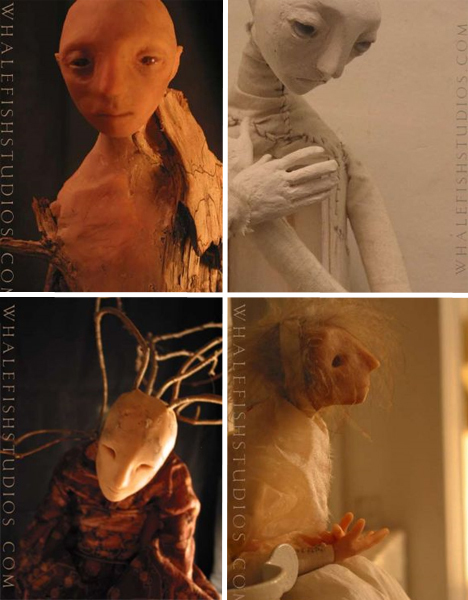 Their dolls are made from the simplest of materials – polymer clay, fabric, leaves and twigs – and are often featureless, but still manage to convey so much personality and vitality. Bulldogs with baby heads. A puppy-inspired creation that is “part dachshund, part chihuahua, and all snake-necked assyrian sphynx”. A sphinx bred with a deer. A woman with the bottom half of a preying mantis. Pat Lillich’s work is surreal yet elegant, ghostly pale but sculpted with such fine detail that they seem almost alive, albeit alien. 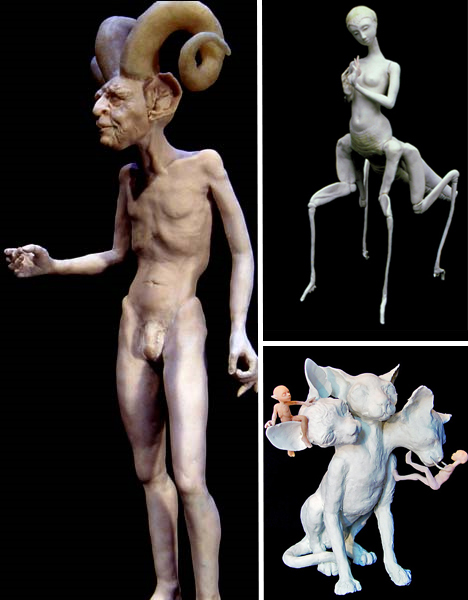 Jon Beinart, founder of the Beinart International Surreal Art Collective, is best known for his ‘toddlerpedes’, recycled plastic doll parts made into monstrous sculptures resembling insects and mythological creatures. 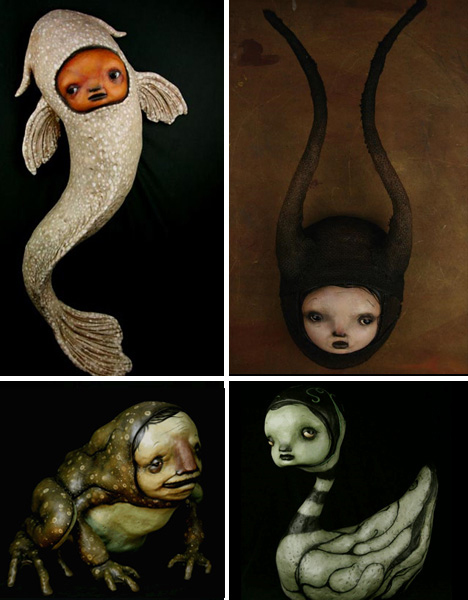 Former video game artist and graphic designer Virginie Ropars happened upon contemporary art doll making quite by accident, finding that her artistic skills translated into three dimensions in a way that she didn’t anticipate. But, she doesn’t call them ‘dolls’. Artist D.L. 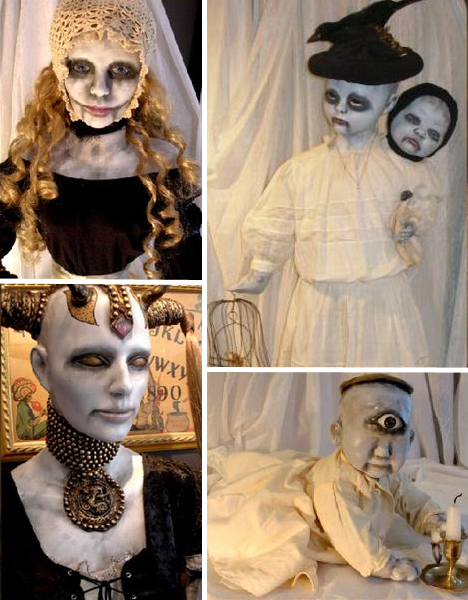 Marian’s ‘dark creations’ don’t beat around the bush in using death and deformity to turn once-innocent dolls into the stuff of nightmares and horror movies. Mutant babies, vampire children, demons and murder victims are just a few of the themes that can be found among this artist’s sometimes stomach-turning work.